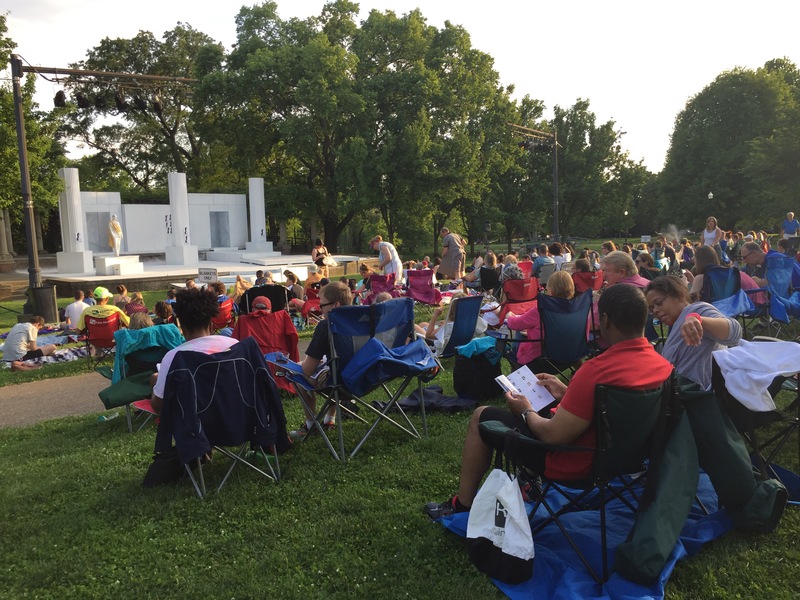 Last night Kish and I legged it over to Schiller Park to watch The Actors’ Theatre of Columbus performance of Shakespeare’s Julius Caesar. It was a beautiful evening, clear and mild, and we sat on the lawn with a few hundred of our neighbors. Shakespeare’s tale of intrigue, conspiracy, and foul murder in Ancient Rome is one of his better plays, featuring Marc Antony’s brilliant funeral oration for the murdered Caesar and lots of memorable lines, like “Beware the idea of March!” and “Friends, Romans, and Countrymen, lend me your ears!” The ATC performance is top-notch — I thought the actors playing Brutus, Antony, and Caesar were especially good — and there is just something intrinsically enjoyable about outdoor theater on a lovely evening. 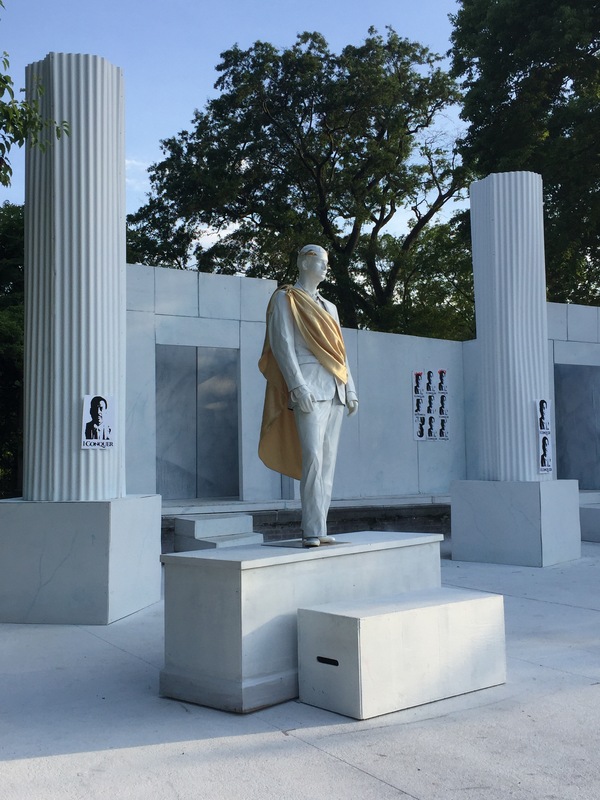 Julius Caesar will run for another two weeks and is the first of four plays that will be performed by ATC this season, which also will feature Pride and Prejudice and Shakespeare’s The Tempest. If you’ve never been to one of these shows, I encourage you to stop by Schiller Park, enjoy some live theater, and toss a few bucks into the kitty for ATC. 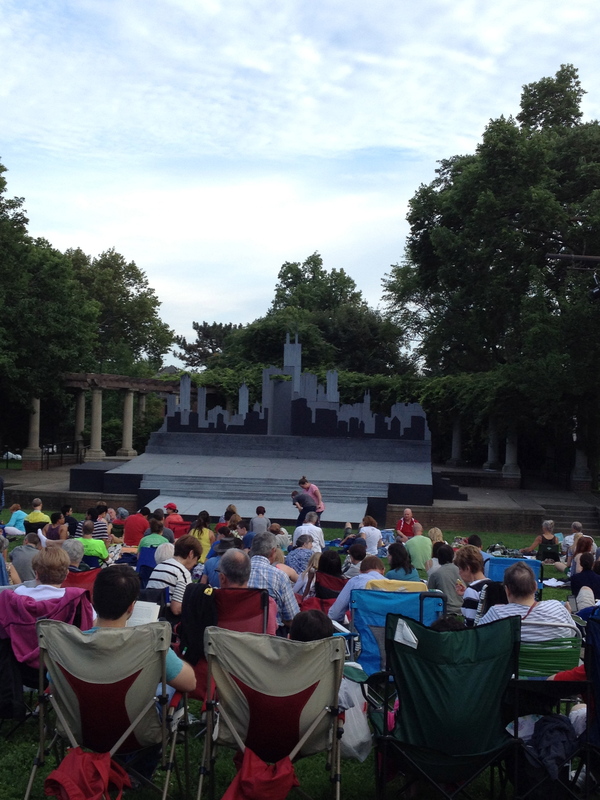 Last night Kish and I went to see the Actors’ Theatre performance of Shakespeare’s Richard III at Schiller Park. It was a clear, beautiful night, which has been so rare in Columbus that we felt like we had to take advantage of it. And what better way to celebrate a pretty evening than by sitting outside, watching one of the Bard’s finest works? In our world William Shakespeare’s genius is just an accepted fact of life, and things that are accepted often, perhaps, are not fully appreciated. That’s unfortunate. Richard III is a fantastic piece of creative work — bright and snapping in its language, brilliant in its cast and settings, and ultimately intense in its crushing moral message. The tale of bloody, duplicitous, deformed Richard of Gloucester, who slays friends, brothers, and children and endures the hatred of his own mother in his ruthless quest for the throne and then is brought low to die alone, is simply one of the very finest pieces of theater that has ever been written. The second half of the play, in particular, is an awesome tour de force, and the penultimate scene where Richard, on the eve of the final battle, is haunted in his dreams by the ghosts of the people he has murdered, who tell him to “Despair, and die!” is uniquely, chillingly powerful. The Actors’ Theatre production does a fine job with this titanic work, with Geoff Wilson, as Richard, and Vicky Welsh Bragg, as Queen Margaret, being particular standouts in my view. Interestingly, the production places the play in a ’50s-era gangland setting, complete with fedoras, pin-striped suits, and Chuck Berry and Frank Sinatra song snippets between scenes, but it otherwise sticks to the original Shakespeare dialogue. The result didn’t quite work for me — “My kingdom for a horse!” shouldn’t come from the mouth of a guy wearing a sharkskin suit, I think — by the play itself still shines. Anyone who loves good writing and good acting should see it. Last night Kish and I enjoyed a terrific adaptation of Henry IV, Parts I and II by Shakespeare & Co., a performance troupe in Lenox, Massachusetts. My lovely wife treated me to front row seats. It was a fine way to celebrate the Bard of Avon’s 450th birthday and will be an evening I’ll always remember. Henry IV will always be one of my favorite Shakespeare plays. I first read it for Shakespeare Seminar, a class taught by Charles Will at Upper Arlington High School in the ’70s. Mr. Will was a great teacher who brought joy and passion to teaching Shakespeare. He loved Henry IV, and all of his students did, too. The teenage boys in the class, in particular, relished the barbs traded between the carousing Prince Hal and Sir John Falstaff, and relished calling each other “vile standing tucks” and whoreson rogues that semester. Henry IV was one of Shakespeare’s most popular plays during his lifetime, too. It not only features witty insult dialogue, but also royal intrigue, roaring humor, rebellion, whoring, swordfights, drinking, death, and the human drama of a difficult relationship between royal father and rebellious, oat-sowing son. But the real attraction for me and for many is Falstaff, one of Shakespeare’s greatest creations and one of the most memorable characters ever devised in literature. 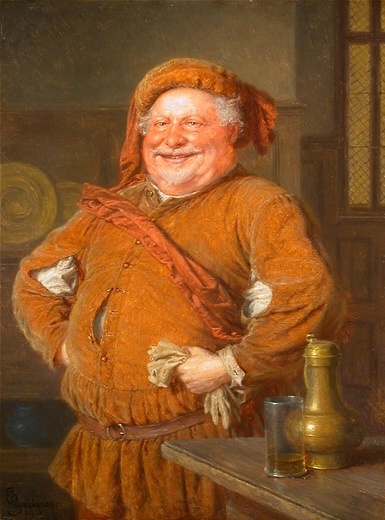 Falstaff, the fat, duplicitous, cowardly, sack-guzzling, honey- tongued, quick-witted rogue, is the true center of the play. When Falstaff is on stage, all eyes are on him, whether he is cheerfully enduring the insults of his drinking companions, playing the king in a jest, coming up with another lie to cover his misbehavior, or making deft observations about the human condition. Falstaff’s wry battlefield comments about the concept of honor as he stands over the dead body of Harry Hotspur is some of Shakespeare’s best writing. It’s a crucial role and not an easy one to play. Last night Malcolm Ingram was wonderful in his depiction of that iconic figure. In a cast that was filled with talent, Mr. Ingram made a great night into an unforgettable one. Mr. Will would have loved it. 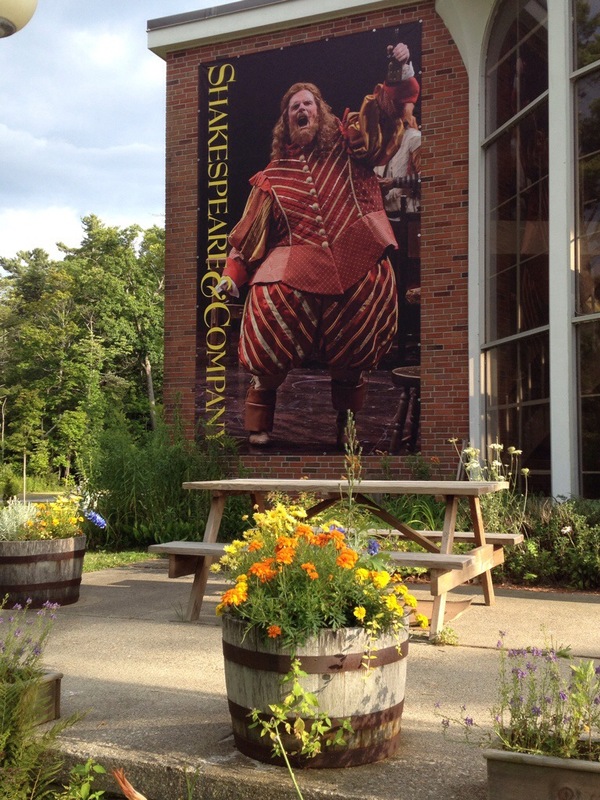 Kish and I are in Lenox, Massachusetts for performances of Shakespeare’s Henry IV, Parts I and II.. Time for some Sir John Falstaff, Hal, and Hotspur, and the Immortal Bard. My Kingdom For A Hearse! William Shakespeare’s gravestone states, in part: “Blessed be the man that spares these stones, And cursed be he that moves my bones.” Now the historical figure behind one of Shakespeare’s most famous literary creations — Richard III — might well share that sentiment. Scientists in Great Britain launched a careful search for the remains of Richard III, and they are convinced they found them — buried beneath an ordinary parking lot. King Richard III reined for only two years and was killed in the Battle of Bosworth Field, where Shakespeare’s Richard III famously cried: “A horse! A horse! My kingdom for a horse!” The dead king’s body was taken to Leicester, England, where it was buried in a church called Greyfriars. But the church was demolished during the Reformation in the 16th century, and its exact location was lost in the mists of time. Historians later determined the location of the church, which is now occupied by a parking lot. They unearthed remains that had been buried in a hurriedly prepared, too small grave, compared the DNA of the remains to the DNA of a seventeenth-generation descendant of Richard III’s sister, and confirmed from the DNA match that the remains were indeed those of the former king. The remains show that Richard III was not hunchbacked — as he is often depicted — but rather was the victim of scoliosis, a condition that causes a marked curvature of the spine. 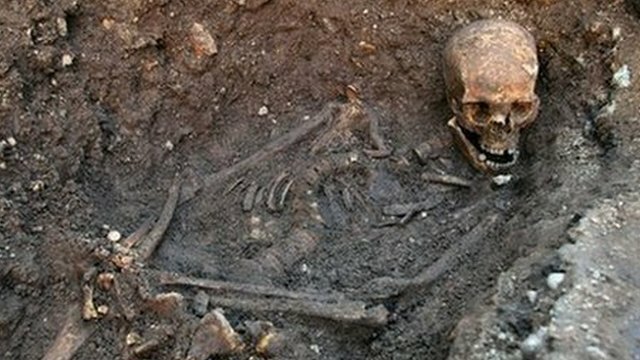 The remains also show that Richard III was treated very rudely at the Battle of Bosworth Field. His skull was pierced by a sharp blade, another part of it was cut away, and it bore the evidence of six other injuries to the face and head. The rest of his skeleton revealed two injuries, including marks on the pelvis that suggests that the king may have taken a spear up the keister from one of the victors on the battlefield. No wonder he wanted a horse! I’ve always thought that Richard III was one of Shakespeare’s greatest plays, and that the Richard III he created was one of his most memorable characters. (If you’re interested in the play but far away from Stratford-upon-Avon, the 1995 film of Richard III, starring Ian McKellen as a Richard transplanted into a modern fascist world, is excellent.) The identification of the remains of the king — which now will be more appropriately interred — just add another interesting chapter to the tale of a fascinating historical figure.